The Text Editors - General page of the Preferences dialog. The Text Editors – General page of the Preferences dialog provides configuration controls related to the editing behavoir of the Text Editor. The Text Editors – General page is part of the main Preferences dialog (File | ) and is accessed by selecting the General entry under the Text Editors folder, in the left hand pane of the dialog. Insert Mode - Enable to make text entered at the cursor be inserted without overwriting the existing text. If this option is disabled, text at the cursor is overwritten. The keyboard Insert key can be used to toggle Insert Mode in the Text editor without changing this default setting. The mode is indicated by the Overwrite or Insert message on the status bar. Overwrite cursor as block - Enable to make the cursor be overwritten as a block. Cursor through tabs - Enable to allow the arrow keys to move the cursor to the logical spaces within each tab character. Cursor Beyond EOL - Enable to allow the cursor to be positioned beyond the end-of-line (EOL) character on the text document. Cursor Beyond EOF - Enable to allow the cursor to be positioned beyond the end-of-file (EOF) character on the text document. Persistent blocks - Enable to keep marked blocks on the text document marked, even when the cursor is moved using the arrow keys. When a new block is selected, the previous block is removed. Overwrite blocks - Enable to allow a marked block of text to be replaced with whatever is typed next. If the Persistent Blocks option is also selected, text entered is appended following the currently selected block. 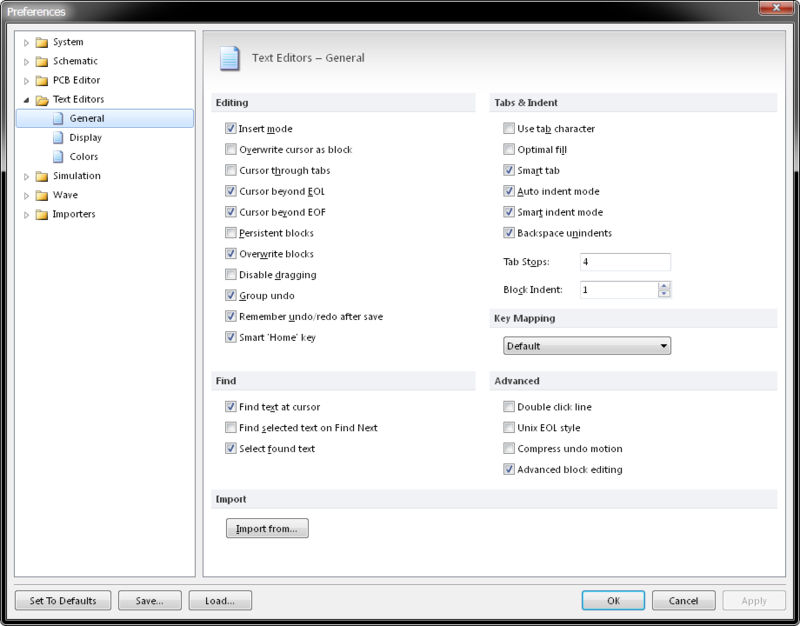 Disable dragging - Enable to inhibit the ability to drag selected blocks of text across the text document. By default this disable dragging option is disabled. Group undo - Enable so that the last editing command, as well as any subsequent editing commands of the same type, are undone in one step when selecting Edit » Undo or pressing the Alt + Backspace keys. Remember undo/redo after save - Enable to make Undo data remain after a text file is saved, allowing all changes to be reverted. This option is enabled by default. Disable this option and all the Undo data is lost after saving a text file. Smart Home key - Enable to make the Home key (when used for the first time) cause the cursor to jump to the first non-space character in the current line, then with the next Home key press, the cursor will jump to the beginning of the line, and so on. This Home key behaviour matches that of the Microsoft™ Visual Studio™ product. Disable this option and the Home key will always cause the cursor to jump to the beginning of the current line. Find text at cursor - Enable to cause the current text at the cursor to be placed into the Text to find: field in the Find Text dialog box. If this option is disabled the search text must be manually entered. Find selected text on Find Next - The normal process for searching text is to press Ctrl - F, enter a string and then press OK, which is all repeated to look for the next string occurance. This option enables the F3 key for subsequent searches, removing the need to re-enter the same search text. Select found text - If this option is enabled, the found text is selected in the document and will be copied to the clipboard when the copy command is used. Use tab character - When enabled, a literal tab character is inserted for each tab. When disabled, space characters are inserted instead. Enable the Use Special Symbols option to see tab characters in the text document. Optimal fill - Enable to make a line auto-indent with the minimum number of characters possible, using tabs and spaces as necessary. Enable the Use Special Symbols option to see the tab symbols on the document. Smart tab - Enable so that a new line will tab to match the position of the first non-whitespace character on the preceding line. Auto indent mode - Enable so that pressing the Enter key to create a new line will also tab to match the position of the first non-whitespace character on the preceding line. Smart indent mode - Enable programming-aware tab behavior, currently used only when editing C files. For example, when this option is enabled and a closing curly bracket is types, the editor will indent this character so that it is aligned to the matching opening curly bracket. Disable this option and the tab works conventionally. Backspace unindents - Enable for the backspace key to remove an indent in one keypress. When disabled, backspace treats indents/tabs and multiple space characters. Tab Stops - Define the editor tab stops in number of characters represented by a tab. Block Indent - Specifies the standing number of spaces to indent text, and the Indent/Outdent space used for a marked block of text. The Indent and Outdent block key commands are Ctrl + Shift + I and Ctrl + Shift + U, respectively. Default - Map the deitor keys to match CUA mappings. Borland Classic - Map keys to match the Borland Classic editor keys. Brief - Map keys to match the Brief keystrokes. Epsilon - Map keys to match the Epsilon keys. Visual Studio - Map keys to match the Visual Studio editor. Double click line - Enable so that a line will be highlighted when a character in the line is double-clicked. If this option is disabled, only the selected word is highlighted. Unix EOL style - Enable so that when a text file is saved, each line will be separated using a single LF character (Unix style) instead of a CR/LF pair. Compress undo motion - Enable so that changing the caret position does not go into the undo list. Normally, if text is modified and the PgUp key pressed, Undo would have to be used twice to restore the text to the original state. With the Compress Undo Motion enabled, that can be done with a single Undo. Advanced block editing - If enabled, all the selected blocks are simultaneously overwritten when typing starts. Import from - Click to import text editor preference settings from Tasking or MS Visual Studio™.